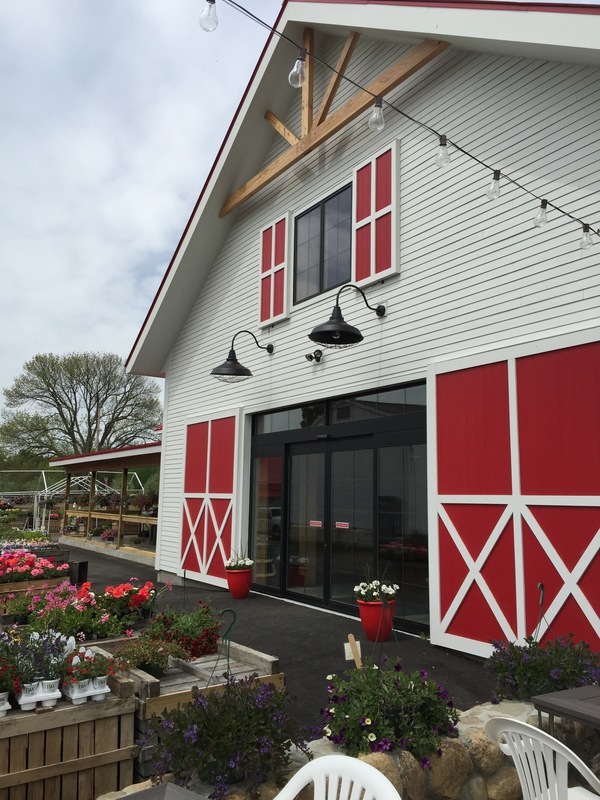 The newest Applecrest farm stand opened on May 15 and mister gardener was one of the first shoppers. As my resident chef, mister gardener stops by on a regular basis, most recently for tender asparagus in season, but this time I accompanied him to sample the farm-to-table wares at their brand new bistro. The new building is vast and impressive…. the farm market, the huge bakery (Ummm…pies, cookies, cider donuts! ), local meats, cheeses, jam, jellies, libations and more take over most of the 12,000-square foot barn structure. Click to view a panorama taken from the entry and you might find mister gardener. We couldn’t bypass the sweet, tender asparagus grown at Applecrest…. displayed front and center. We filled bags for several meals and an appetizer for an upcoming event and had a walk-about to see what other organic goodies we could find. We needed a grocery cart for this! The area is large and the fruits and vegetables were fresh and tempting, displayed in appealing rustic bins made with reclaimed barn wood in keeping with the building’s design. It was early in the day. We could order a tantalizing late breakfast at the bistro or enjoy an early lunch. We chose lunch and while they prepared our meal, we toured the attractive dining area. Inside and outdoors on the stone terrace, tables were adorned with fresh flowers and to take off the chill on a cool morning, a fire blazed in the stone fireplace. We decided to dine outdoors overlooking the old orchards that are in full bloom. I chose a light lunch and my fresh beet salad was quite tasty and the presentation was lovely. mister gardener chose the crispy fried pollock with green tomato tartar, fermented cabbage and Maine potato fries… that I sampled and declared thumbs up. There was a smile on every face at Applecrest and the service was wonderful. Yes…. we will be back. 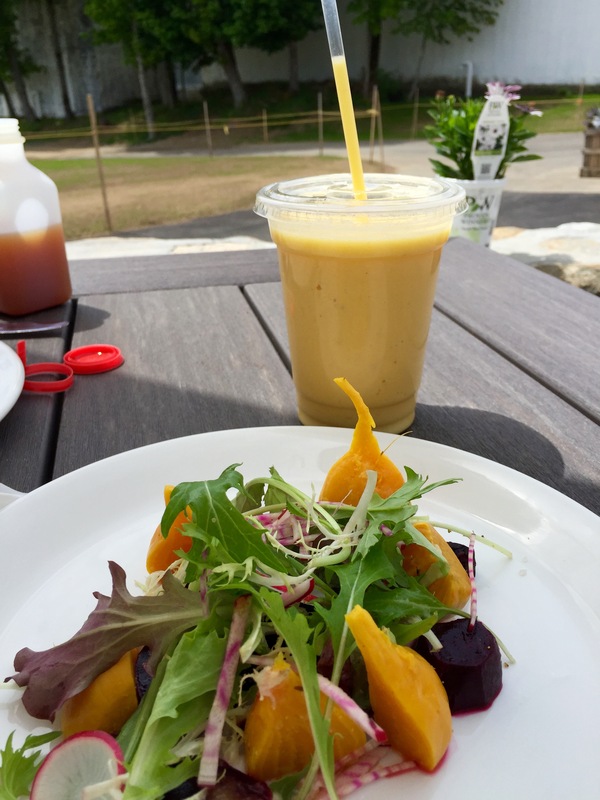 This entry was posted in New Hampshire and tagged Applecrest Farm Orchards, Applecrest Farm Orchards Bistro, Farm-to-Table, Hampton Falls NH, Organic, Produce by Annie. Bookmark the permalink. Looks like a perfect spot to shop and dine! The farm-to-table movement is so strong in New England. 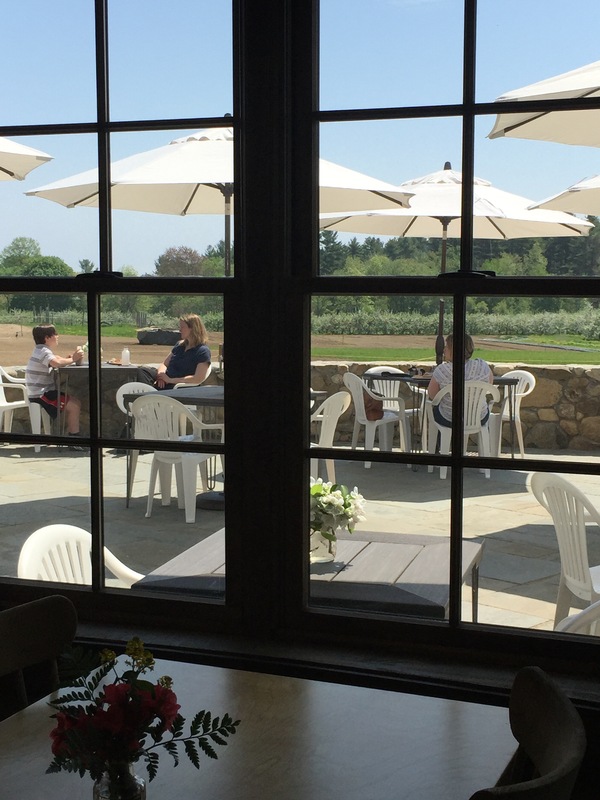 It makes it fun to discover great places like Applecrest Farm. Thanks for the wonderful preview, can’t wait to dine there! I should have added that they are fast becoming energy self-sufficient with solar arrays making them almost 100% off grid. Bravo! Wow, I didn’t know that, how fantastic! Ann, this is the nicest farmers market I have ever seen. I’m sure it will happen one day. We have a long bucket list of New England sites that we’re slowly crossing off. I do wonder if we’ll ever visit them all…. Yea! You found him! He’s far right at the checkout counter …. to the right of the lady holding her little boy. Didn’t realize it had been so long since I checked on you. I found Mr. Gardener, too!